If you’re looking for reception locations near Wayfarers Chapel or another local Rancho Palos Verdes ceremony site, Los Verdes Golf Course is the best wedding venue for you. Located atop a rolling hill crest in Rancho Palos Verdes, this remarkable outdoor wedding venue boasts panoramic ocean views from Malibu to Catalina Island, and all of the facilities take full advantage of this natural beauty. Your guests will arrive via the private circular drive and walk towards the wrought-iron gates opening onto the Terrace. There, they can enjoy cocktails and appetizers and take in views of the towering pines on one side and the inviting glass doors to the Vista Ballroom on the other. You may also opt to conveniently host your ceremony on site. 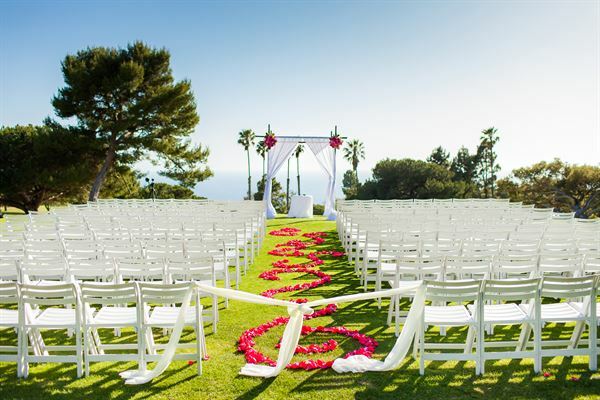 The ceremony site stands amid rolling fairways splashed with floral colors and views of the azure sea. If you want a memorable ocean view wedding where guests will witness your exchange of vows against a backdrop of spectacular scenery, then this beach wedding location is ideal. The dedicated event staff is happy to assist you with finalizing the details of this most special of occasions. Our larger ceremony site, the 10th Tee Box offers amazing views of the Pacific Ocean and our lush golf course. One of the special photography locations we have on the golf course is our 15th Green. It is located at the furthest tip of the course, overlooking Catalina Island and offers some of the best sunset views! Whether you are hosting an intimate wedding ceremony or a cocktail hour, the Catalina Terrace offers amazing views of the Pacific Ocean, our lush golf course and Catalina Island. The Vista Ballroom include a large built in dance floor, floor to ceiling windows showcasing ocean views, house projector and screen, and modern décor in neutral shades of ivory, sand and cocoa.